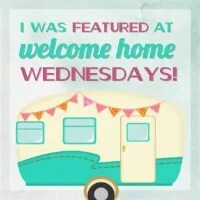 Welcome to Welcome Home Wednesdays #90!!! Wow, we’re at #90! Thanks so much for linking up every week. It’s a pleasure seeing you here and partying with ya! Let’s get started! Each week our little party gets even bigger… and we’re so glad you’re here to party with us! So bring your friends and link up something awesome… we love to see your amazing work around here! Don’t forget to leave us a comment to let us know you stopped by and we’ll do the same when we visit your link! The party will start each Wednesday at 7am CST… and we’ll be here bright eyed, bushy tailed and ready to party! Stop by and share your fabulous posts… we would love to read them and share them with our friends! The Spotlight! That’s right… Features! These people were extra cool last week… so we’re featuring them this week! That means they get a little time in the spotlight…and a cameo on our social media accounts (if you’ve ever wanted to hangout on my facebook page this is your chance!) Sounds awesome huh?! For your chance to be featured make sure to follow all of your hosts on social media… and leave us a little note so we know you’re following!! Just pop over and leave a comment on Facebook (or Twitter, or Instagram… whichever one is your jam!) We look at every single link so we don’t miss a beat! The Rules are there ain’t no Rules! We ain’t your Mama… so we don’t have a strict rules list. View this more as party etiquette! 1. Be kind! Read and comment on your fellow party goers links! 2. We like to think we’re super fancy… we want our guests to feel fancy too so no link-party or affiliate links please! 3. If you want to be featured please follow your hosts on social media… then link back to the party with a text link… or our fabulous button! 4. Link to a specific post… not your home page! We want to see what you’ve been up to this week! 5. Our mama’s taught us to share… that includes the limelight! No more than 3 links per person please! 6. That’s it! Have fun and link up your best stuff! We can’t wait to see it! 4 Gals, 4 Blogs & 1 Great Party! Link up once to appear on 4 Amazing Blogs! Want to come back next week? We’ll send you a reminder… just put your email in the box! Like any good hosts we’re sitting right by the present table waiting until our guests leave so we can go through the loot… the loot being your Welcome Home Wednesdays #90 links! We can’t wait to check out what you’ve left for us. Trust me there will be a lot of pinning, tweeting and facebook sharing going on in the near future… we can’t wait to show off what you’ve left! Thanks so much for featuring my floral crowned deer head! A little out there – I know 😉 Have a great week Erin! It turned out wonderful! Thanks for partying with us! Hope you have a nice week! Wonderful seeing you here, Kathryn! Enjoy the party and enjoy your week! Thanks Erin for co-hosting the 90th Welcome Home Wednesdays, always appreciated. Thanks for taking the time to leave a comment and thanks so much for partying with us every week, Joy! Thank you for hosting. I would love for you to party with me at #WonderfulWednesday, #Recipe Sharing Party (Thursday) #ThursdayFavoriteThings, or #OverTheMoon (Sunday). Enjoy your week! Hello there, Marilyn. Can’t wait to see what you linked up this week! Enjoy your weekend!